There are many dangers in childbirth, but there are none greater than when the baby is harmed during the process. This may occur with various tools, methods or if there are complications that arise in the middle of the procedure. When someone owes money to a debtor, this account is often referred to a debt collector. Debt collectors must follow federal law and state law when attempting to collect this debt. If the debt collector does not follow applicable laws, it may be liable for violations. Criminal defense cases often need an expert witness to verify facts, reconstruct a crime, explain how certain injuries were caused by the actions of the perpetrator and similar concerns. There is even the need when someone commits financial crimes such as fraud or theft. Some experts are forensic accountants, fraud investigators and professionals that have extensive experience in tax fraud, money laundering, bribes or corruption in financial markets, instances of embezzlement and investment concerns. Dangerous substances have a variety of effects and hazards to those exposed to them. This could occur through inhalation, skin contact, ingestion and even burns through contact on clothing. To understand how these issues harm the victim and what consequences arise through these materials is important. Small businesses operate under the fear that they will one day be sued. Today, someone can sue a company for nearly anything. Even if the plaintiff sues a business and does not prevail, there can still be a significant impact to the business that must defend against the claim. Often, significant economic damages may be alleged that rival the damages lodged against big businesses. Fraud is often a very damaging crime to those affected. The theft of information or funds from a company tends to harm multiple persons, and it may lead to a continued problem for the business. When certain information is taken, it may be highly injurious based on who is involved and how much is stolen. Defamation may not always be applied to business transactions, clients or customers, but even companies may be affected by false statements. When a single person is the victim of defamation, he or she may have his or her reputation negatively impacted. In some situations, this may lead to economic and financial difficulties. Injuries and cases of slips, trips and falls are prominent in certain industries and with the elderly. It is important to understand how to avoid these complications, and why those harmed in the process need certain compensation. Many slips and trips occur in building with floor hazards, but these may occur at home due to wires, carpets and obstacles. Many cases have the need for a medical laboratory in issues with malpractice claims. This means that certain aspects need further testing, or there are factors in a medical malpractice suit that need clarification. This usually requires the assistance of a medical laboratory expert witness to explain these details and processes. Perinatal malpractice usually involves injuries to the baby before, during or after the child has been born. These could occur through the methods used to assist the infant out of his or her mother, the procedures utilized when he or she resides within the mother’s body or the care taken with the baby once he or she has been removed. In some situations, a person may wish to pass his or her property to a business partner, friend, church member or other individual outside of his or her own family. Understanding what heirs are and any statutory right to inherit is important. An expert witness can explain the steps that are legally necessary to effectuate this transaction and whether they were or were not present in a specific situation. Before signing a commercial lease, individuals may consider possible ways to protect themselves before the lease, during the tenancy and after it. An expert witness can provide assistance in discussing commercial lease disputes and settlement negotiations. Sometimes a person may wish to transfer real estate, whether residential or commercial, to another person. However, when conducting these transactions, legal complications may arise, necessitating the use of an expert witness to explain potential legal complications. Business transactions between companies are often complicated due to the amount of information that must be passed back and forth between them. There are certain associates that must coordinate the data and facilitate the transfer. Intellectual property is owned by the person that designed, created or invented the item. However, there are many cases of infringement on the legal protections obtained to safeguard the object from public use, competitors and reproduction. If someone has been violating the patent, copyright, trade secret or trademark, a lawyer versed in this form of law is needed. Business processes are often difficult to analyze and understand in a court room for the average person. Numerous complicated cases are extremely difficult to prosecute because the crimes are not understandable. An expert witness that has experience in the field of the business is often able to examine the documentation and grasp the details necessary to show how the crimes occurred and why the person is not at fault. In fraud scams or criminal activity, there may be someone that is blamed who took no part in the incident. Hazardous chemicals are both dangerous and lethal to humans when they come into contact with the skin or are inhaled. Some chemicals are such a risk to the health of a person that not having a breathing mask could lead to death quickly. There are many compounds that may be created which could harm someone, and numerous chemicals found in homes or buildings could lead to the same dangerous results. Hiring multiple expert witnesses for a single case is beneficial when the matter is either complicated or includes more than one single aspect of a claim. This may occur through using economic impact combined with a car accident, personal injury cases and medical experts for assistance as well as a variety of similar circumstances. Road construction zones are often dangerous to drivers on interstates, highways and freeways. The rate of higher speeds and more vehicles is greater in these areas than on regular roads or smaller highways. Electrical accidents often require reconstruction of the incident so that the judge or members of the jury understand what occurred during the accident. This also means that an expert witness is needed to detail how the injuries affect the victim. Infestation of insects is often one of the worst possible problems with real estate that a homeowner discovers. The Department of Labor’s (“DOL”) new fiduciary rule was set to take effect on April 10, 2017. However, in a Memorandum to the Secretary of Labor on February 3, 2017, the President proposed delaying the applicability date by 60 days. Abusive head trauma is a serious injury where the brain is impacted through pressure and force. These injuries usually occur through abuse to a child who is still developing, and it is also called shaken baby syndrome. Conflicts between business owners and shareholders are not uncommon. The duties and direction between these two groups are often opposing. These conflicts are often more pronounced when dealing with smaller businesses. These businesses may not have as extensive oversight as publicly-traded companies do. Recognizing the adverse nature between the parties can provide an expert witness with the background to explain the conflict to a judge or jury. Getting the building and safety codes correct in any case is vital. When the expert cites or reports the wrong codes for a litigation case, the credibility and reliability of testimony is reduced in the eyes of a judge or jury panel. This means that the case is not as strong and the chances of success are lessened. Concussion injuries are common when someone plays sports. Because of this, there are many litigation cases that arise through accidents and unintentional harm. It is often important to seek the assistance of both a personal injury lawyer and an expert witness to explain how sport concussions affect the victim of the incident. Immigration cases are often complicated when there are multiple factors or enough elements to cause a success for either side to be uncertain. Various immigration issues stem from those seeking asylum in the United States when they cannot remain in their own country. Personal injury claims usually must have the elements of the case include proof that the defending party’s actions caused the incident. This makes the individual responsible for the damages owed. In order to refute this, the alleged person uses his or her lawyer to assist in showing that he or she could not be accountable due to a lack of evidence. Many law firms that offer a multiplicity of practice areas often have difficulty cross-selling these disparate services to their roster of clients. When mold is prevalent in a home or in a business setting, it may lead to serious health consequences. This substance may be a concern that started with a construction defect, through the upkeep or maintenance of a landlord or landlady or when repairs are completed. Planning for the future when death is inevitable is often fraught with complications when there are family members that may contest the last will and testament of the deceased. Police brutality is being increasingly noticed throughout the country through the use of electronic surveillance equipment and the rise of the smartphone. With a camera and a video recorder at the touch of a fingertip, anyone is able to record almost any incident that may transpire. Carbon monoxide may lead to poisoning, injury and death when someone has been exposed to too much of the gas. It is colorless and odorless, so it cannot be see or smelled but it may be see in smoke. However, because it weighs less than oxygen, it spreads quickly. There are times when a company loses profits through an incident caused by an individual. This often leads to injury to the company or someone specifics that either owns the business or works inside. Expert Witness: How Can an Expert Identify Construction Defects? When there is a need for a construction expert that must be used as a witness in a court case, he or she should have extensive knowledge and experience in the construction world. This means that all aspects of accidents, injury, defects and similar concerns regarding construction should be understood better than the average person. Personal injury claims are difficult enough with an experienced and knowledgeable lawyer, but when the victim of the incident becomes brain dead, the problems multiply. Many are unsure what to do next, how this affects the case and what may be needed due to these severe consequences. 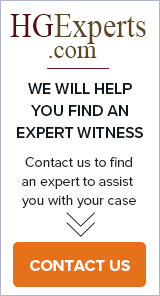 Expert Witness: What Does a Child Custody Expert Witness Do? Child custody cases are often plagued with complications, arguments and conflict on both sides. When both parties vie for the custody of the child or children affected by the dissolution of the relationship, both family lawyers and expert witnesses are usually needed to settle the disputes. Child abuse is often a lifelong concern once it has been suffered through the abuses by an adult or other child. Most often, when a youth suffers from these malignant experiences, he or she is harmed by someone he or she loves. When someone drinks before or during a drive, his or her blood alcohol level tends to rise. It is when it is above the legal limit of .08 percent that the person may be expecting a driving under the influence violation when pulled over. How Does an Expert Witness Help with Business Valuation? Setting up procedures that are used to determine and estimate the financial value of the interest of a business owned by a person is business valuation. It is used for the market and what may be used as a starting point in pricing for the sale of a company.